It is often believed that , once ashore at D-Day , the Allied Armies then had a clear run to liberate France. Nothing could be further from the truth. The fighting in Normandy, and after, equalled in intensity and casualties anything experienced during the Great War. The losses in Infantry in particular were such that by the Autumn , the British Army were scraping the barrel to find enough men to keep their Divisions up to strength. 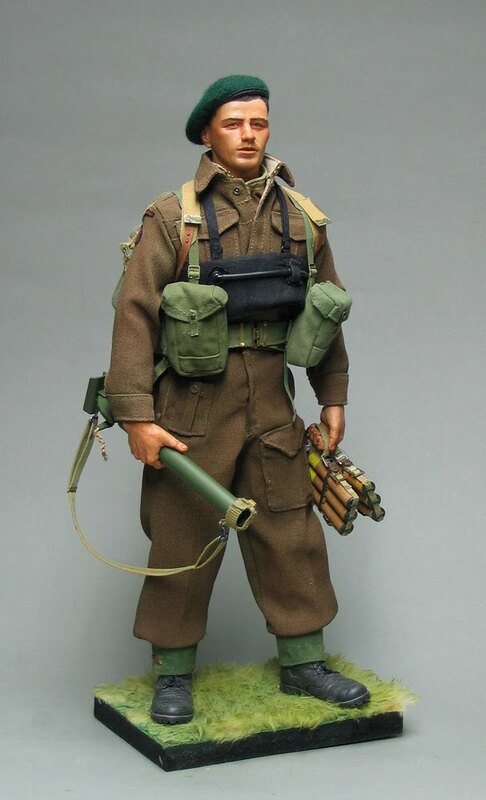 Battledress, the famous green beret , and a great deal of equipment supposed to make him self-sufficient for three days , including a Bergen rucksack and a 2" mortar. He's armed with a Browning pistol , his chief job being to operate the mortar .The lifebelt will be discarded at the first opportunity. Taken from a photo taken in a French street, this fellow is from the 3rd Infantry Division , the heavily trained assault Division that was first ashore on D-Day. 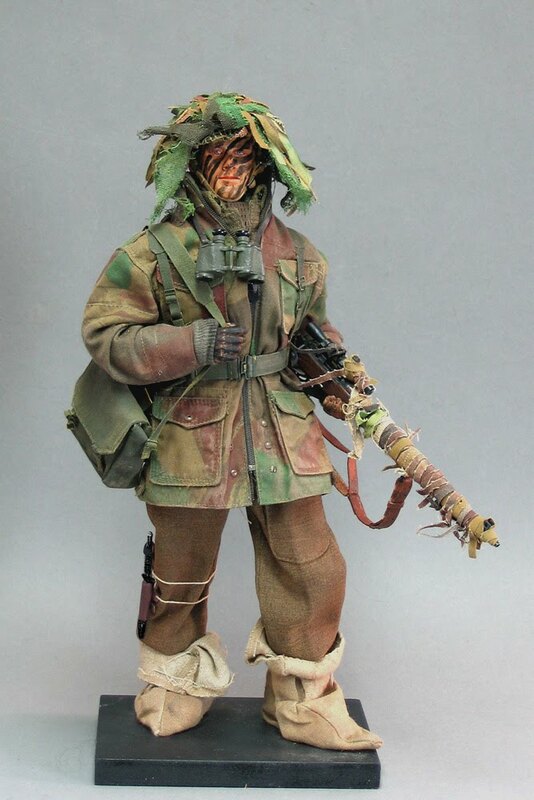 He wears the Mk.III helmet , carries a Sten Mk.III ( known as "the Woolworths version" because it was so cheaply made ) , and as a Corporal , he carries a machete for clearing undergrowth . 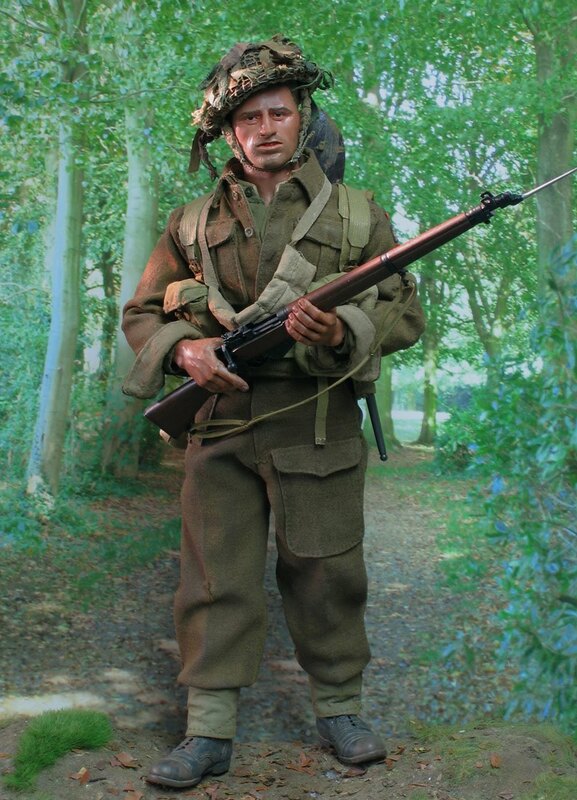 I have been lucky enough to interview Harry about his service career , and this figure is based on his very exact descriptions of what he wore as a sniper in Normandy. He was wounded shortly after this, but returned to see out the rest of the N.W Europe campaign , as Britain's most successful sniper. This is his typical outfit : he wore various combinations of clothing during the campaign , but this was his most usual rig . After it saved his life in Normandy , he always wore a helmet, here covered with camouflage. 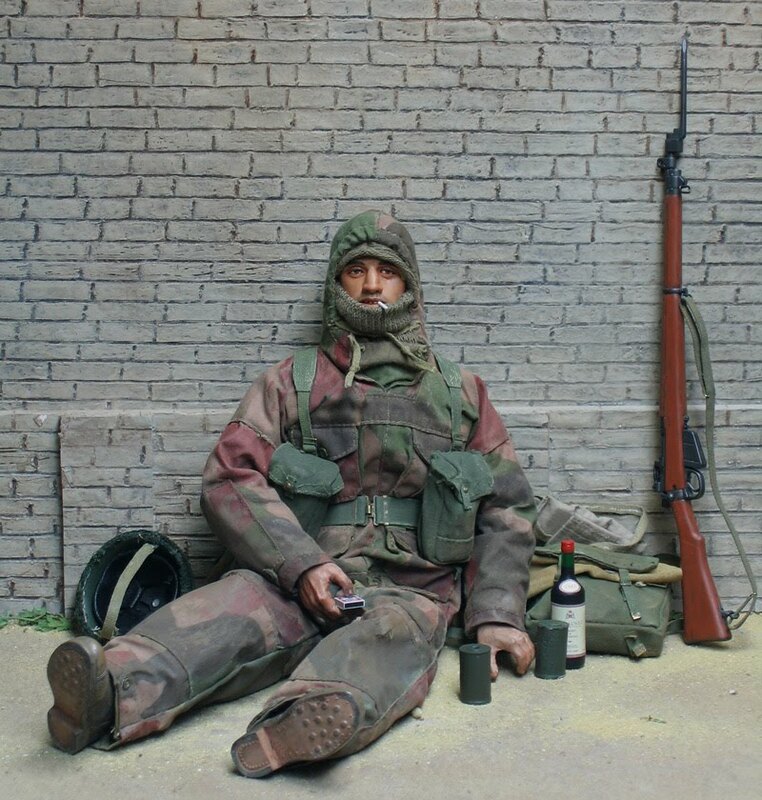 Modified Denison smock, painted and blancoed webbing , face veils , face camo from soot , an extra waterbottle , and sandbags to cover the boots, which he occasionally wore . He carries green-painted binoculars, and a scout telescope in the special rear pocket in the Denison smock . The PBI up the Sharp End : thousands like him fought and died in the hedgerows , orchards and stone villages. The heavily vegetated closed- in landscape hid mines, machine guns and all the horrors arranged by his highly professional opponents. Most casualties were caused by mortar fire ; many battalions lost 150% casualties by the time of the break-out. But they stuck to it, despite the feeling that they were outclassed in weaponry and command. 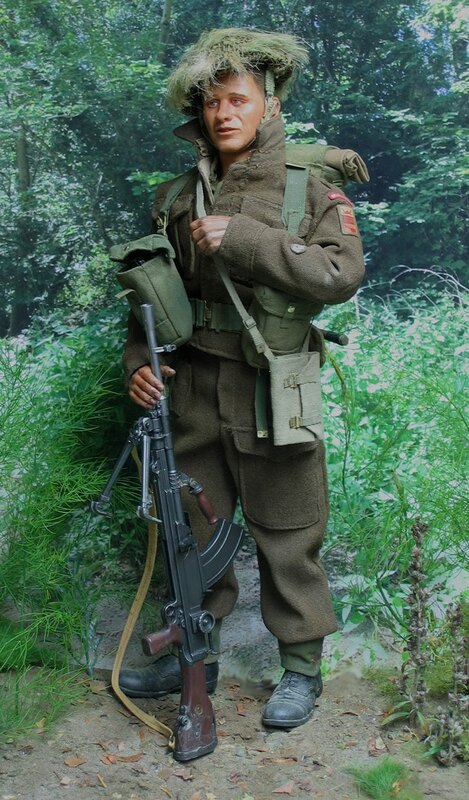 Each section of Infantry carried a Bren LMG, the real firepower of the section. All the other soldiers carried magazines for it, and operating it was both an honour and a hazard, since it tended to attract return fire. Veterans are agreed that it was superb weapon. he has spent the morning lying in a meadow , camouflaging his helmet with grass, which is now quite inappropriate. 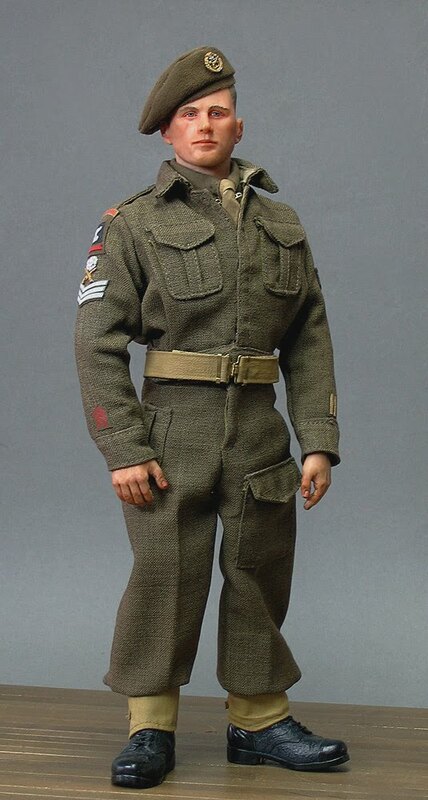 He wears the Divisional patch , with the little saucepan symbol , and the BG Bren Gunner specialist badge on his forearm. The webbing has been coloured green with " Blanco ". The flat webbing pouch contains the tools for servicing the Bren . 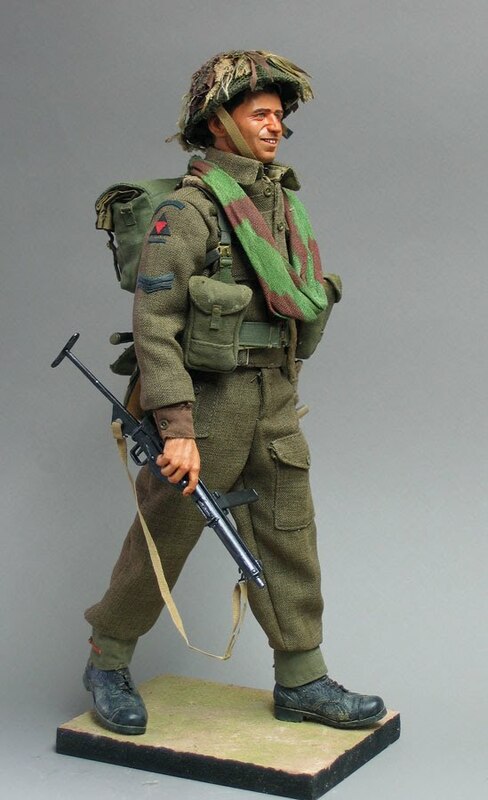 Frankie , Highland Light Infantry , Walcheren , November 1944 . The winter of 44-45 was very bad : one of the coldest on record , starting early and finishing late. The British Army issued rather inadequate winter clothing , but one of their better ideas was this windproof suit, made from a very fine weave cotton intended to cut windchill. The camo pattern had a distinctly pink bias , quite unlike any other type in use. They were widely worn by some infantry formations during the winter, including this Scots-Italian from Glasgow, resting after the assault on the island of Walcheren in November 1944. I hope he epitomises some of the sheer exhaustion and discomfort of war. He is waiting for his can of self-heating soup to warm up .